The Serbian legendary director and his rock band, The No Smoking Orchestra, performed the punk opera “Time of the Gypsies” at the KUBANA Festival. The idea of performing a punk opera based on Kusturica’s cult film “Time of the Gypsies” first appeared in 2002, and, five years later, it premiered on the stage of the Bastille Opera House in Paris. It went on to enjoy great success in Serbia and Greece, as well. Now, in Kuban, it has been performed in the open air for the first time. Music by Goran Bregović is used in the film, but, for the opera version, the tragic love story of Perhan and Azra is accompanied by music arranged by Dejan Sparavalo, Nenad Janković and the director’s son, Stribor Kusturica. “Theatre is an abstract space, and this space gives you the ability to work miracles: theatrical tricks as practiced by the Russian Meyerhold (something between a circus and serious theater), a mix of genres on the stage, where you can experiment," the Serbian director says. "We are talking here about something made on the foundations of classical canons, but, on the other hand, visually quite unusual. I think it is very romantic to join opera and punk. In the present time of capitalism, people need to move away from the mainstream culture. I, for instance, have always tried to stay away from it,” he added. “We live in a world of corporate capitalism, a world in which the values have absolutely changed in comparison with the values of the previous century. 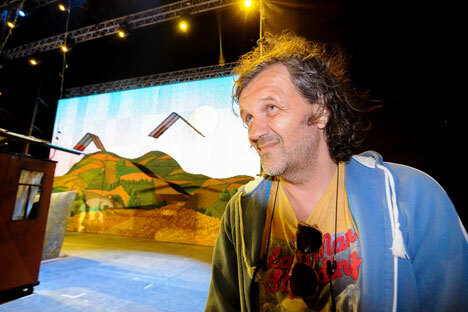 And that is why I want to stay away from the mainstream culture—even if, to do this, I have to call this opera that I stage a ‘punk opera.’ Yes, punk is dead, but long live punk!” says Kusturica. Speaking to reporters, Kusturica mentioned that he is currently working on a large project that involves Russia. For the last few years, the director has also been working on a film about Dostoevsky. Based on materials from RIA Novosti, the newspaper Komsomolskaya Pravda and Rossiyskaya Gazeta.